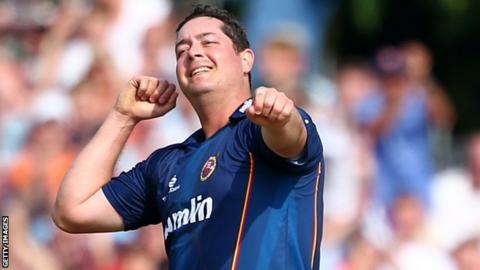 Essex are hopeful big-hitting all-rounder Jesse Ryder will sign for a second season. The 30-year-old has averaged 30 with the bat and taken 27 wickets in the County Championship this season. "He'd like to come back and we'd certainly like him to come back," head coach Paul Grayson told BBC Essex. "It's a matter of sitting down in the next couple of weeks and hopefully we can sort a contract for him to come back next year." Ryder, who has 18 Test caps for New Zealand, has continued his good form this year by hitting 58 in this week's match against Kent, and he also averaged 92.25 in the One-Day Cup. But the Wellington-born player has also impressed with the ball, taking five-wicket hauls in County Championship and T20 matches. Essex can still win promotion to Division One, but will need positive results from their three remaining fixtures. They will have to do it without young seamers Tymal Mills and Reece Topley though, who are both expected to miss the remainder of the season with back injuries. "It's been a frustrating year for the pair of them," Grayson said. "We just seem to have one injury after another with our bowlers. Hopefully we can get them all going for next year."